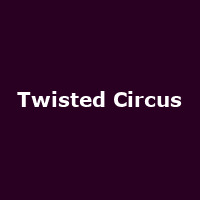 "The Twisted Circus is a huge National party which has been hosted at Indigo at the O2, Bloomsbury Ballroom and Shaka Zulu. More than just a party, their weird and wonderful circus acts perform routinely and shape your evening to anything our imagination can conceive! Entertainment on rotation from Stilt Walkers to Fire Breathers to Acrobats, the acts combine to create a twisted experience."